SOL sat down chat with the talented Moscow based Interdisciplinary Designer and Creative Connector Ksenia Tokmakova who works on personal and commissioned projects internationally. Her expertise covers various mediums from editorials to curated environments and set design. Ksenia believes in creative collaborations reaching all mediums while pushing the boundaries of her skills and talents in order to attain personal and professional growth. 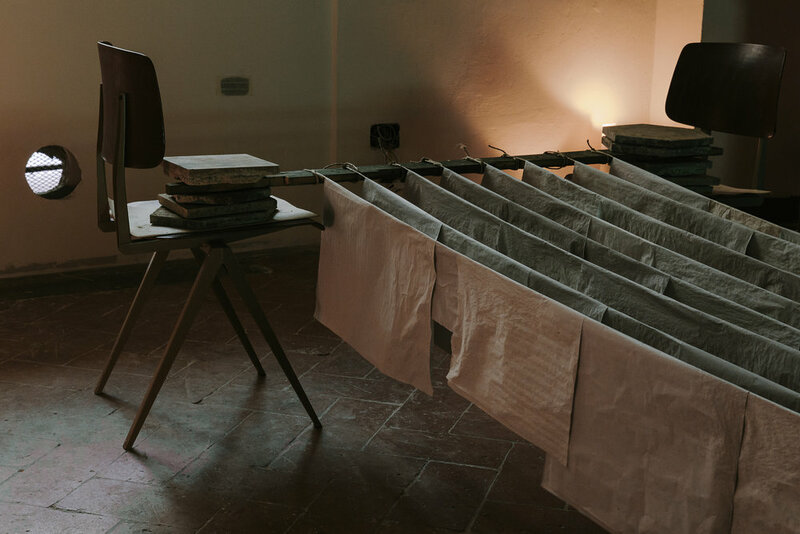 Ksenia spoke to SOL about her start in the creative world, her views on Aesthetics and her most recent exhibition FRAGMENTS together with Marinka Sadgyan held at Numeroventi in Florence and how Alberto Giacometti’s Femme Leoni perfectly sums her up. Make sure to check out Ksenia’s past and present projects on her Behance portfolio here: and her daily inspirations on @thechomie. Has creativity always played a big role in your life? It has always been deeply rooted in me. My parents did play a huge role in raising me to become the person I am, and then later my own will to continuously push beyond my own limits — motivated by curiosity and the will to challenge my personality and expand my skillsets by constantly trying new things. Curiosity is hence my drive combined with a passion for the creative world. Philosophically speaking I completely understand and fully support the vision and direction — where a link between the historic and contemporary remains strong in the long run; where whatever is done or produced contributes to society and is supported by the meaning behind the brand and honesty in the materials that are used. It is good that I express this idea — a good motivation to stay true to my word! I’m afraid I cant’t recall an early memory of mine but rather a memory of something a stranger once said and that keeps spinning in my head when I’m in doubt — «You are a very special person and should always stay true to yourself regardless of everything, and you will have a wonderful life and future». I can’t consider it a push to my vocation but a healthy reminder — that at the end of the day when you think about yourself and you know you’re still a good person, then you’re on the right path. As someone involved in the field of design, aesthetics plays a vital role - what does it mean to you on both a professional and personal level? I believe, everyone has their own view and sense of aesthetics — which varies from one person to another due to culture, family or self-gained preferences. I appreciate objects that people surround themselves with, which are usually considered to be less arty — though they might look arty and yet are humble in use. Even as I am directly involved in this sphere I respect and see architecture as an organic whole and always look for a relationship to the environment rather than solely to a particular object it inhabits. Our environments, in their turn, play a significant role in inspiring and shaping us, which goes deeper from just being aesthetically pleasing. I would say I have an eye for certain visual things from every day life that I collect and this has now built a distinct vision of my life needs and the projects I choose to get my hands on. Take us through your creative process when working on a project? I enjoy being involved in experimental processes — sometimes not knowing how to do things at the beginning but then slowly finding the right approach. That's the best learning opportunity — interacting with other people to explore new things and getting to know those who are very specialised in their particular fields. This teaches you a lot and more importantly a lot about yourself. After studying you come out with a bunch of ready-made, let’s say, templates and tricks on how to get a project started but with practice you notice, it doesn’t necessarily help and, to some extent, puts you in a cage of boxed thinking. Let your intuition take the lead and stay courageous. Inspiration is everywhere — we just have to open our eyes and embrace what’s around us. Nature, people, random conversations, culture, architecture — even simply light and shadows, contribute vastly to my perception and forms the grids of visual and tactile sensations — which never entails a shortage of inspiration. Surprisingly or not, I start understanding myself better when brought out of my comfort zone, while traveling or trying to live in a different place, for instance — and it’s where the challenge begins that transforms me in my very core. Slowly but determinedly I keep pursuing my dreams and ideas, and I’m grateful when people on my path bring out the most of me by making me exceed my limits. 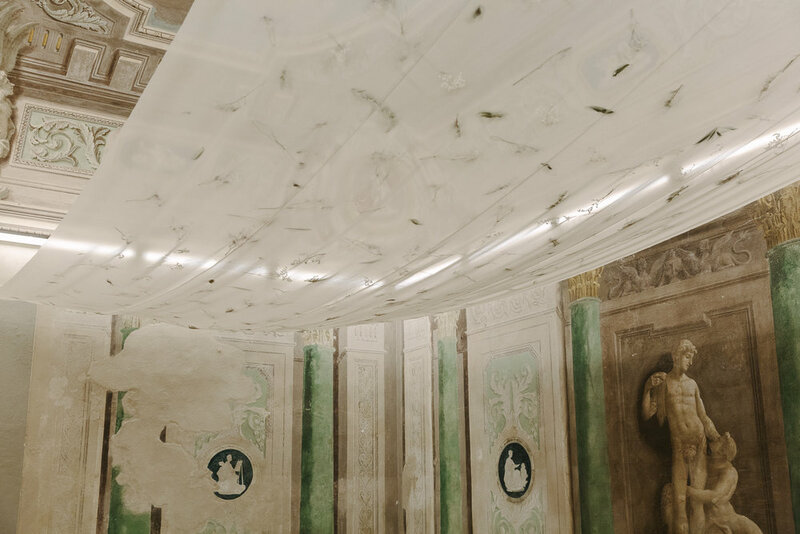 You recently completed an exhibition FRAGMENTS with Marinika Sadgyan at Numeroventi in Palazzo Galli Tassi in Florence - tell us more about this experience and the idea behind the show? I’ve known Marinika since our Design study days and, therefore, the choice of doing a project together didn’t come out of the blue. I was conscious that being involved in work with friends often forms or ends a relationship but in our case, we complimented each other and perfectly balanced our personal backgrounds and visions into one. As a pre-work reference we started with the statement «the future belongs to the past — the past is already the future» thinking on how these two parts are inextricably linked in our present life — as while moving forward we shouldn’t forget to look back, to see how the past has influenced us and how much effort has been put to be where we are and what we’ve come to have at this moment. Today’s almost non-existent boundaries between art, design and architecture gives us the opportunity to create site-specific installations that can coexist with the space and emotionally expand it. So from the beginning, it was clear to us that we needed to pay homage to that and which later in the process expanded on both cultural scales — one covering a particular circle (recalling the “100 herbs syrup” invention by the former owner of the palazzo — Girolamo Pagliano) and another one touching every person respecting the World heritage (recreating the scene of the flood in Florence that started on November, the 4th, 1966). The two installations, though visually varied, created a dialogue between each other and reflected on the power of nature that can both give and take away. What do you think is the future role of aesthetics and creativity in our society? Today, what worries me greatly is ethics between people — not just in work-life but in day-to-day existence. There should always be respect for the work done by others or actions addressed with good intention. Furthermore whatever we create — right or wrong for one or for others- should aim for simplicity. After all the problems we experience daily are complex enough and therefore the solutions must be simple. I think creativity is there to set people free from stereotypical thinking. In my view breaking free from the standard way of doing things is commendable and something to aspire towards. I am exited to see what the industry is going to offer us in the coming years —the future is unpredictable and exciting! Talking about the future: are there any exciting projects on the horizon for you that you would like to mention? «Expect the unexpected» is my motto. I'd love to collaborate with people from different fields making objects, building things that matter and bringing heartfelt-joy and good to their creators. A couple of exciting projects that mean a lot to me are on their way — I won’t reveal them just quite yet though! I will continue my ongoing writing contribution for Anniversary Magazine (Montreal) and a piece I wrote for Sindroms Magazine (Copenhagen) White Issue will soon be published. Writing for publications is quite unexpected from my side — challenging and radical for me, but just the way I am. I must admit, there are probably way too many! I don’t limit myself with any boundaries or a selection of disciplines and truly believe that interdisciplinary can make our work-life more exciting and unexpected in terms of results. Every trip, every event where you can meet new people might lead you to an unlimited number of ideas, and it’s where exactly I am at this moment. You are always on the move- where can one creep on your work? I am constantly shaping myself, and most of the projects I work on are done spontaneously, without any specific plan ahead. You can view my portfolio of old and recent projects on Behance, or see what inspires me from what I encounter daily via Instagram @thechomie. You can also read the agenda and review on our FRAGMENTS exhibition on Anniversary and Le Paradox. Finally if you could be summed up in one artwork- what would it be and why? Right now, what comes to my mind is the bronze Femme Leoni by Giacometti — delicate and fragile on the outside but strong and self-assured on the inside. I see much of this affinity when people mistakenly confuse my sensitivity with defensiveness. The sculptures of Giacometti transmits my current vibration of being extremely distant and at the same time very close to where I need to go.